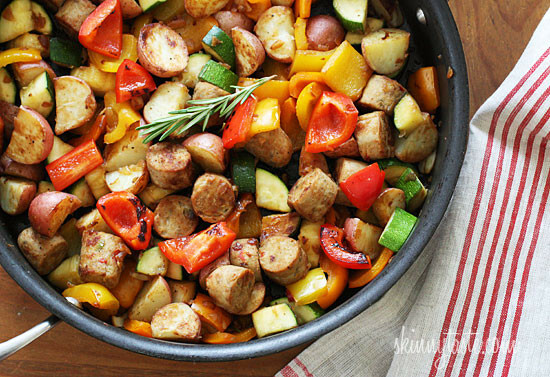 Lean Italian chicken sausage with summer bell peppers and zucchini sauteed with baby red potatoes and fresh herbs for a quick one pot meal. I love a meal that only dirties one pot because although I may love to cook, I really don’t love to clean! 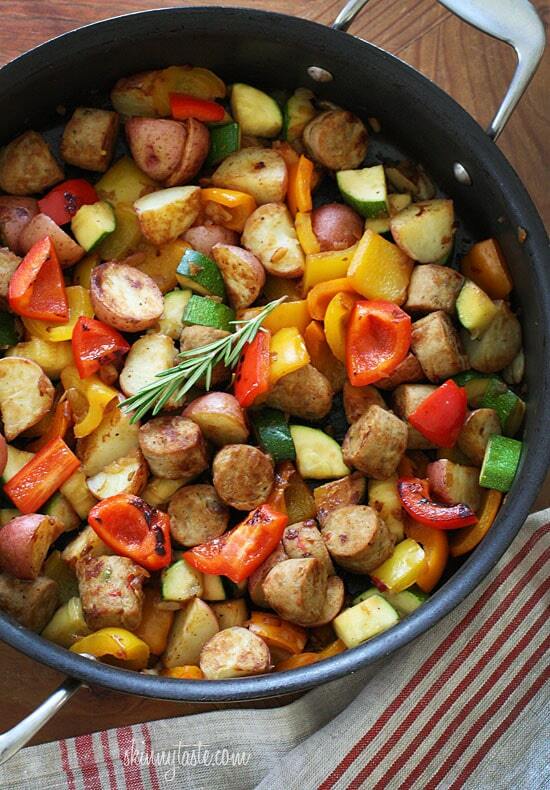 I labeled this as kid-friendly because my older one (the pickier one) loves this and my younger one will eat the sausage and peppers, but picks out the potatoes. Since every child is different I’ll let you decide! This is also gluten-free for those of you with a gluten intolerance, dairy-free and egg-free. 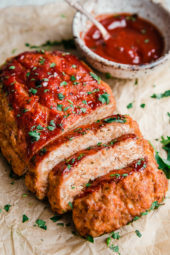 You can use Italian chicken sausage or turkey sausage depending on what is available to you in your area. I’ve tasted several brands and really came to love Al Fresco’s sweet chicken sausage and Premio’s chicken sausage. My local health food store and Italian deli also carry their own homemade sausage which is wonderful. If rosemary isn’t your thing, use fresh thyme instead. Place oil and potatoes in a large, deep non-stick skillet with a tight fitting lid on high heat; season with garlic powder, salt and pepper. When the skillet gets hot and starts to sizzle, reduce heat to low and cook with a tight lid on for about 20-25 minutes, shaking the pan occasionally to prevent the potatoes from burning. Remove from heat and let them sit 5 minutes without removing the lid, then set the potatoes aside on a dish. Add the sausage to the skillet and saute on medium-low and cook, stirring occasionally until browned but not quite cooked through, about 10 minutes. Season chopped vegetables with salt and pepper. Add onions, peppers, garlic and rosemary to the skillet and mix. Continue cooking, stirring occasionally, until onions and peppers become slightly browned. 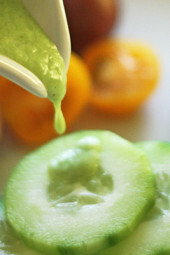 Add zucchini and cook an additional 5 minutes, mixing as it cooks until cooked through. Makes about 7 1/2 cups. I was looking for a recipe that would incorporate bell peppers and baby potatoes and I found this one. I had to substitute Italian sausage and broccoli because I did not have any chicken sausage or zucchini. Also, I only salted the potatoes before cooking them and did not add any additional salt later on while cooking. The seasonings were perfect. This is simply delicious. I will definitely make this recipe again. Gina, how would you do this in an Instapot? I haven’t tried this is in the instant pot yet. Very good. The family liked it. The potatoes were perfect. I kept the cover on the pan the entire time the potatoes cooked, without lifting to stir. They got nice and soft. I used apple chicken sausage. I had to take out a dish of vegetables and potatoes when they were finished and added shrimp for my vegetarian son. Wow. My three very picky eaters liked it and all 3 want me to make it again. I did use ring sausage. I precooked the potatoes separate like a couple of reviewers suggested. I used thyme because I didn’t have rosemary. I didn’t use the zucchini because of my picky eaters. I’m eating this right now, didn’t think it would turn out so good! I’m a son in our family house and its my turn to cook on Sundays. I usually stick to basic british meals but throught i’d have a look on here for some ideas. This is by far one of the best things i’ve cooked, loads of compliments from family and I think they’ll want it next Sunday because I do! Glad everyone enjoyed it! Happy cooking! So mine of course didn’t look as pretty as yours but it was delicious! I used turkey sausage cause that’s what was in the house. This will go in the must make again pile for sure. We had this for dinner the other night. It was delicious! I used oregano (dried) for the spice as that’s what I usually use for sausage, peppers and potatoes. Thank you for a nice, lightened up version, perfect for the warmer months! I made this last night for dinner and it was a hit! Very tasty and even my picky teenager loved it. Thank you! This is on my top 10 list of skinnytaste recipes- just love it!! This was absolutely delicious! I cannot believe how tasty and healthy your recipes are! I made this tonight. Very nice!! I made a few changes tho i had pork sausages in the freezer so used them instead of chicken and i added a cup of thickened vege stock to give it a bit of moisture. Served wirh crusty bread, beautiful ???????? This recipe is one I want to try – it’s the kind of dish I know we will like. Do you have a print option somewhere on your page. I work in windows 10 and don’t see one. I don’t have a laptop and would just like to print it for my use. Yes it’s by the ingredients. I absolutely love this, and all of your recipies. I am embarking on this weight loss journey to be healthier for myself and my family. With your amazing ideas, I’m down 8 lbs in two weeks. Thank you! I made this tonight and added jalapeno peppers to the mix. It was delicious! This is my all time favorite quick, healthy meal!! Such amazing flavor!!! I use sweet potatoes vs regular. Fantastic!!! Is it possible in any way to make this in a crock pot? Yes but I don’t know how the taste will be. It will certainly chance the flavor. I made this tonight and it was AH-MAZING! I used sweet potatoes vs baby reds and they were done in no time (not even 10 mins!). Then I added in some apple chunks! Delish! My husband loved it (low carb! with great flavor) and my 5 y/o daughter LOVED it. She loves “hot dogs” aka sausage and a pepper and sweet potato feen! This will be a new go-to meal at our house. Thank you!! This is soooo good! I’ve made it twice so far and it’s always a hit with the family. I cooked the potatoes separate while I cut up the vegetables and put them in with the sausage in a skillet. I used 2 packages of mild chicken sausage and one packet hot sausage, added green pepper into the veggies and minced the garlic instead of smashing it with the knife. I added some Creole seasoning to give it some kick and dried rosemary instead of fresh because it’s what I had on hand. I added chicken broth to make sure bits wouldn’t burn on the bottom while the whole thing cooked together. Paired it with some rice and voila an amazing, yummy dinner! Made this tonight and it was delicious! The husband had two servings and said I could make this anytime! The 8-yr old daughter said it would be better without the zucchini. Haha. Thank you!! I absolutely love this recipe – so colorful! I made this with the Al Fresco chicken apple sausages and red onion, and it came out quite good. Very good and very filling. Thanks for another good one pot meal. Keep them coming coz we don’t love to clean up after either. Great recipe. Used hot italian turkey sausage and substituted mushrooms for some of the peppers. So tasty!!! Hi. What are the Smart Ponits for this recipe? It looks great! I just made this…Amazing as usual. Thanks for another great recipe. Love this recipe. What are the smart points for this? I've made this twice now and absolutely love it!! Makes great leftovers (hot or cold). I make the potatoes in a separate pan to cut the time in half. I also use hot Italian chicken sausage links from Sprouts; cook them in links for 10 minutes, remove from heat and slice before adding peppers, etc. Made this for Father's Dinner today. OMG So good! I'm not a sausage fan and this I liked 🙂 Added some hot pepper flakes to give it a little extra kick. Thanks Gina! Ran into this recipe lately. It is not summer, but I used what I had on hand and this turned out very well. Since St. Paddy's Day was a couple of days ago, had cooked potatoes, carrots and cabbage left. Used that plus red and green peppers, onions and mushrooms. Added some garlic and thyme and used turkey smoked sausage. Love that this is good with whatever, and helped me clear out my fridge. Thanks for the recipe and all the comments!! Making this for dinner tonight with your Crockpot Applesauce!! Perfect for a cool fall day!! Love all of your recipes! This recipe says it serves 4. I was in the middle of preparing this awesome recipe when I learned I had 6 for dinner instead of the 3 I planned on. I added pasta (rotini) to extend the recipe and it was deeeeeeeelicious!! This was the first time I had ever made this so I don't know how it would have tasted without the pasta. I'm going through a crazy, fresh vegetable (and fruit) phase and I saw this today and made it for dinner. Outstanding! 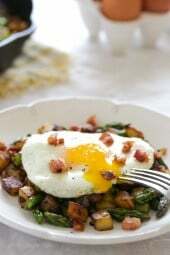 I made it with andouille sausage and it was fabulous! This sounds great! But I do have one question. Do you mince the rosemary or just throw the leaves in whole? Rosemary leaves are somewhat thick and rigid. I'm just afraid the texture would make me feel like I'm eating, well, leaves. I made this for dinner last night and it was seriously delicious, my husband loved it too! We'll be having the leftovers tonight! Just a thought – I cut my sausages with kitchen shears … worked well! Well – I wasn't sure how my boys would like this … but they did. Cut the baby potatoes up finer than prob. you do. I, too did not have them done in even half an hour – so I popped them in the microwave for a few minutes to finish them. I think I would really like to try this again with a Kielbasa. I used dried thyme (no fresh) and instead of zucchini (again didn't have any) I used mushrooms. I cooked mine in a huge cast iron dutch oven on the stove. I prob. also cooked mine longer …. but I like the crispy bits of onions. I think I'd cut the peppers a little smaller. Smelled great …. definitely will save this one! Very good! This may be a silly question, but do you remove the casing first before cooking the sausage? This was SERIOUSLY AMAZING! I used spicy turkey sausage. A little difficult to cut because it's so soft. Next time, I might put it in the freezer for a bit to make it a little easier to cut. I also added a container of crimini mushooms sliced in half. I kept my heat on medium with my potatoes (I used baby Yukon Golds cut in about 3/4 inch pieces as that's what came in my farm box). About 10 minutes in when they were getting a bit brown and carmelized, I put in about an 1/8 cup of red wine to deglaze while the potatoes were still in there, then popped the lid on for about 3-4 minutes until the wine was gone. This bit of steam got the potatoes done well within the 20 minutes but kept them brown and delicious – and with great flavor! I used an orange and yellow bell pepper and threw in some cayenne for a little heat. The hubby and I both couldn't stop saying YUM as we ate it! Is that what you should do; deglaze the pan, when the pan starts getting too gunky and the browning going too fast? I've always wanted to know what to do when that happens. Delicious! I'm making this for our Outer Banks vacation this year. I have to cook for 20 but I'll have help chopping the veggies and how simple to just get 4-5 skillets going at one time! I'm thinking some fresh bread from the oven would be a great addition. I'm thinking our crowd will love this. Really, really good with any kind of vegetables. Very simple to make! I loved it!! I made this recipe with spicy sausage. It was absolutely amazing. I did what others suggested and made breakfast with the left overs.. Ah! it was just as good! I scrambled some eggs into it with some cheese! yummmmyyyy! Thanks for the recipe! This recipe is incredible. I love how it kind of turned into a stew. So easy and tastes homemade in the best way. It made the house smell amazing and I can't wait to make it again. Easily scaled up or down depending on the size of the crowd. Thanks for the recipe! I just featured it on my blog, bigcitydreamsbyabby.blogspot.com. This was amazing! My BF says he has dreams about it – he would eat it every day if I would let him. So easy and delicious! Very forgiving recipe – you can add or sub in anything you have in abundance and whatever fresh herbs you have on hand. We were almost fighting over the leftovers. The sodium content is so high….how can it be reduced by at least one half. I personally didn't add any salt — but went nuts with the pepper, garlic & rosemary on top. It was great just that way. I made this tonight for dinner though we used pork sausage cause I couldn't find chicken. But it turned out so amazing! We served it over quinoa and it was so good and we even have enough for lunch tomorrow. This will be a keeper in my house! Thank you for sharing! I wish I would have read the comments before starting this! My potatoes weren't even close to be done after 40 minutes so I ended up having to roast them in the oven. Then I made the mistake of putting the lid on when the veggies went in, which made them sweat, which means the onion and peppers never got brown. Ugh. But it tastes DELICIOUS so who cares if it ain't pretty? Thank you, Gina! i love this dish! i like to use smoked turkey kielbasa. it adds for faster cooking as well. And its REALLY good with an egg on top! Yours came out WAY prettier than mine! Still, it was delicious. This was amazing for dinner last night and I'm just about to attempt the microwave reheating of leftovers. The only thing we did differently was cooked the potatoes separately in their own pan at the same time as the sausage & veggies. Time > Dirty Pans in my house! It cut down the time to about 30 minutes total: 10 minutes to chop everything, 20 to cook it all. Thanks for the tip Jenny! I did the same with the potatoes. Worked out great. This looks wonderful. May I ask if you serve anything else with it? I don't but perhaps a salad? I served Ina Garten's Corn and Basil salad…all summer flavors…amazing pair, I think. Sooooo good. Seriously, I have not tried a recipe of yours yet that I did not like. I don't know what I would do without your site. Thank you for all your efforts. 🙂 Almost all of the recipes I use come from skinnytaste! Thank you for all of your wonderful recipes! This is one of my family's favorites. My 2 year old even gobbles it up, veggies and all. This was really delicious and a good way to use up my leftover pepper and onion bits! I used Tony Cachere's creole seasoning for more of a cajun twist since I am not a fan of Rosemary… all I have to say is Yummo! 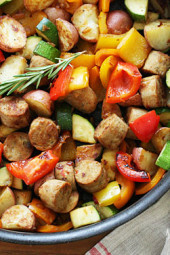 Anyone tried this with meatless sausage? I think some white beans would make a good sub for the sausage. Made this last night for my husband and I and it was delish!! He loved it, he did not even notice the zucchini and when he was done he said that was "really really good" "It was full of veggies and was so flavorful"
Had this last night.. Soo good! My 10 year old went back 3 times-minus onions! Love all of you recipes-have one most nights and have lost about 10 lbs so far! Keep up the good work! This is a sausage dish my family has made for generations, potatoes, onions and sausage being the constant–other veges as are in season. Good stuff. For a twist, add quarters of fresh tomatoes and serve with crumbled feta on top. Sliced apple or pear also adds a nice dimension. Can I make this with sweet potatoes? I made this for dinner tonight, a friend had given me a few heirloom tomatoes today so I let it cool a little and added some of those chopped up with basil, the result was tasty! thanks for the inspiration! made this for dinner tonight very yummy and very colorful! I never get bored, I love to hear the feedback. I pinned this on pinterest and finally made it tonight, it was delicious! I used an enameled cast iron dutch oven to make it, and used an italian dried herb mix instead of rosemary. Needed to cook longer until the potatoes were more 'done' or softer. My husband loved it and I will definitely make it again. This was a really cool way to cook potatoes… never tried that before! My kids love this dish SO much. I love the beautiful colors…I also love that you can pretty much throw in any veggies on hand and it is awesome. Baby portabello mushrooms were to die for in this. Thanks Gina!! I made this for a breakfast carry in — it was nearly all gone! I really loved having a gluten-free, dairy free choice at the carry-in!! I cooked it in my cast iron, then transfered it to my crock-pot to leave the house! Amazingly delicious! Made this for dinner tonight almost exactly as written, except my potatoes weren't done after 20min, so I nuked them for a bit while the sausage and veggies cooked. I deglazed the pan with a splash of white wine because I was afraid of the stuck spices/onions burning. My husband votes strongly for shrimp next time and I think it'll be awesome, and it was already super good and flavorful. I'll be making this often!